When you see one of those lovely silver pots sitting on somebody’s stove, you just know you are in the home of a true coffee lover who can appreciate beans the way they should be. I myself am something of a coffee nut, and so I wanted to pass on my findings to you. I had the chance to test out all these cool pots, and it was easy for me to narrow it down to the four best moka pot. Believe me, they are not all created equal, and you definitely have some imitators out there trying to make you fall for inferior products. Go into it smart, with our handy guide! We will examine the pros and cons of each different pot, talk about how it performed during testing, and tell you about the taste of each drink brewed. It was fun to test, and every consumer deserves to be in the know. Get a bag of your favorite grinds ready. 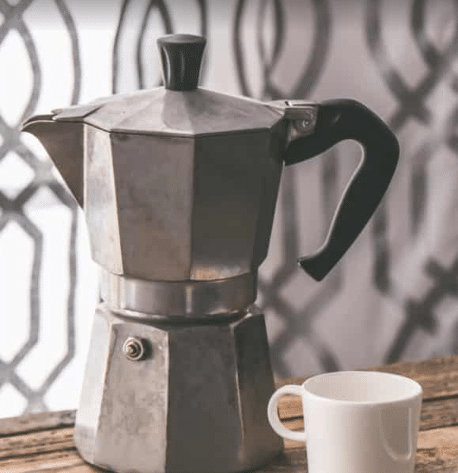 What is a Moka Pot… and Which is the Best? The moka pot is one of those appliances you didn’t know you needed until you figure out what it is! It is a stove top or electric coffee maker that produces the drink by passing the boiling water pressurized by steam through ground up coffee. It is named after the city of Mocha and was invented by an engineer- the Italian Alfonso Bialetti, to be exact, in the year 1933. Today, moka pots are produced-the same model in fact-under the name Moka Express by Bialetti Industrie. You find the moka pot most often in Europe and Latin America. The design is unique and iconic, displayed in art museums around the world for its amazing shape and design. (Honestly, the more you look at it, the more friendly it looks). You use a moka pot over a flame or an electric range. Traditionally, these pots are made from aluminium, but some variants have been found made of stainless steel and other alloys. The Brikka model by Bialetti is a modified moka pot that incorporates a valve that is weighted on top of the nozzle that allows pressure to build inside the water tank in a way that is similar to how a pressure cooker works. The weighted valve serves as a pressure regulator. As the pressure builds compared to the standard moka pot, it reaches the level required for water to go through the ground coffee in a shorter period of time. The catch is this, though: The weighted valve allows the pressure to build and the temp to rise higher before the liquid comes through the nozzle. IN this manner, you get coffee brewed at a higher temp and pressure which results in a brew that is more like espresso and features more visible crema. 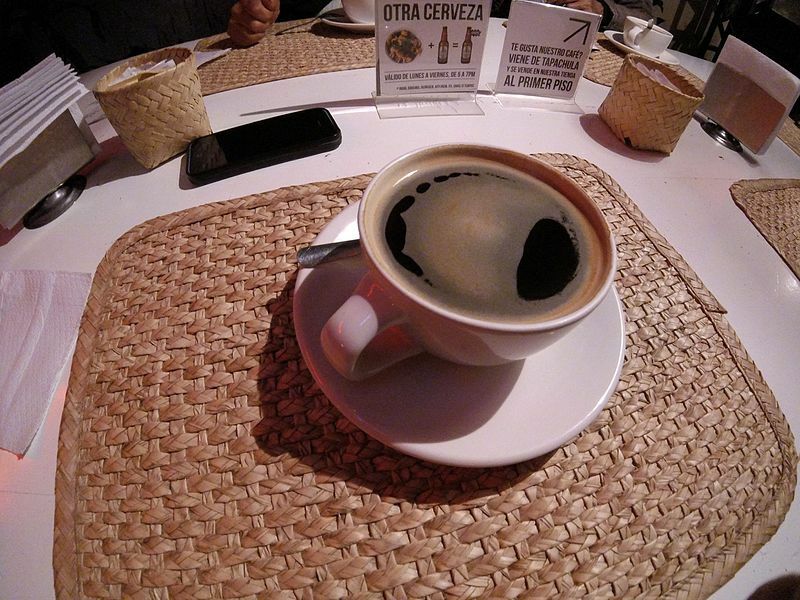 Crema, for those new to the coffee world, is a long espresso drink… And even if you don’t know what it is, I guarantee you will fall in love with them after your first one! 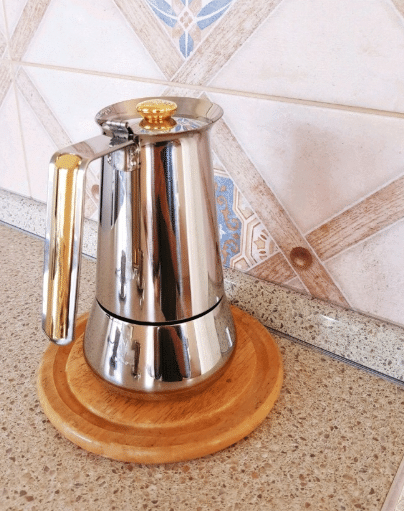 There are loads of stainless steel moka pots out there for your consideration, but those are just two of the ones we will discuss. You can check out sources like Wikipedia to learn more about the history of the moka pot. It is a lot more interesting than you think, and really interesting to think that such a small appliance had such a big impact on the world and coffee culture as a whole. Can I Brew Coffee with a Moka Pot? You absolutely can! The boiler is filled with water nearly to the safety release valve, and the funnel-shaped filter is then installed. You then add finely ground coffee to the filter, and tightly screw on the lid to the base. You then put it on your stove-gas or electric-and the water is brought up to its boiling point. Steam is created in the boiler. A gasket makes sure that the unit is closed tightly and allows for the pressure to build up in the lower section in a safe manner, and a safety valve will provide release in the event that the pressure becomes too great. The steam then reaches a high enough pressure to eventually force the boiling water up the funnel through the coffee grinds and into the upper part of the machine, where coffee is collected for serving. You may think that the coffee is much too hot to drink, but it actually stays at standard brewing temps even when using this special method. 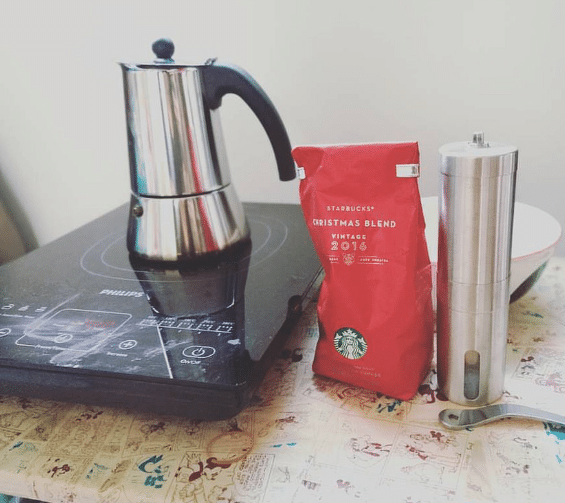 How Can I Make the Best Coffee Brew with My Moka Pot? 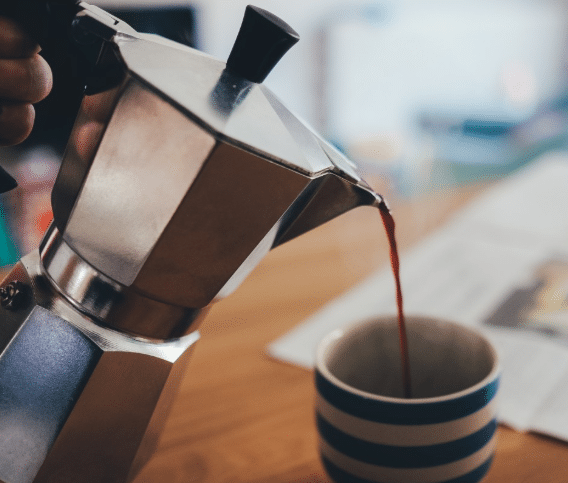 This may not be the most practical guide for those of you that have busy mornings but if you can follow these steps, you can rest assured you will get the best brew you ever had out of that italian coffee maker. Start by preheating your water. Use filtered water if you can. Stop the kettle just before it boils. Starting the process with the hot water allows the extraction of flavors to take place faster and prevents the pot from overheating, which ends up scalding coffee grounds. If you are using an electric range, you should turn it to medium heat. The grind should be coarser (we will talk about this later on) than you would for espresso but finer than the type you need for a French press. If the grind is too powdery and fine, you will over extract the coffee and get something that is horrendously bitter. Try out some different grind settings and figure out what works for you personally. Flavor is a personal preference that varies from person to person, so just find out what works for you and go with it. After this step pour the hot water into the bottom pot and fill it to the bottom of the safety valve, regardless of how many cups you want to make. Spare a bit for the bottom of your espresso cup as warm cups make a difference in how we enjoy our coffee and the experience overall. After this fill up the basket with amount of coffee, and then flatten it out with your finger. Do not tamp it into the base of the basket, as the grounds should actually be loosely packed. The extraction is powered by the pressure created by evaporation that is created in the low pot and compressing these grounds just gets you an over extracted and bitter tasting brew. Now put the basket that is filled and flattened into the lower pot. By filling the basket up with coffee beforehand prevents grounds from littering onto the thread. Screw it on using an oven mitt so you don’t burn your hand on the hot base. Now put it on the stove. Leave the lid open so the chamber will not overheat. Just use a moderate level of heat. Now watch for the first sputter of coffee. The coffee should come out like a thick golden syrup if this is done right. As the extraction takes place over time it will become lighter and thinner. Remove it from heat when you start to see it pale. Set it on a cool damp cloth to cool down the base and prevent counter burns. You will also avoid burnt tasting coffee in this way. How Do I Clean My Moka Pot? Cleaning one of these is easy. All you need to do is clean thoroughly using warm water. Use a nice soft cloth. Do not use an abrasive. Don’t use steel wool, it will just lead to corrosion. It is very critical that you do not use soap as this will take away the coffee oils from the coffee grinds that were inside your italian moka pot. Also make sure that you remove the gasket and the filter, running them under water and loosening any debris. Let it dry completely before you reassemble it. Once it is completely dry you can then reassemble it and start enjoying that great taste again. 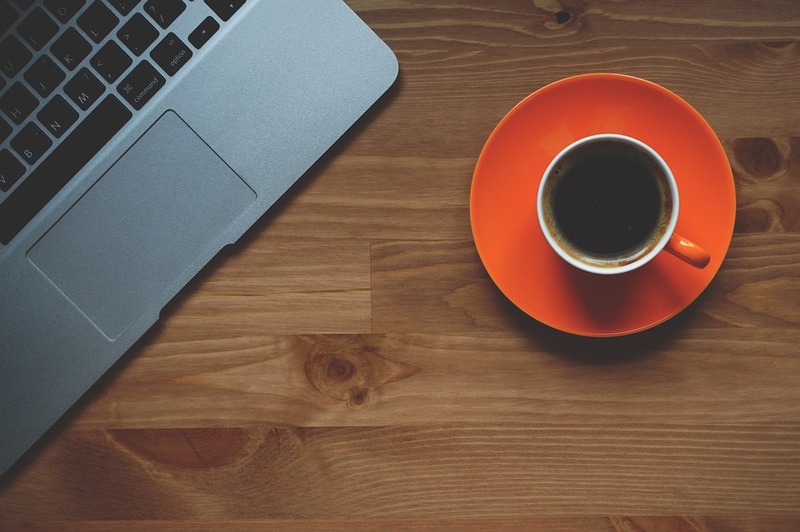 The Best Moka Coffee Maker – We Picked 4! Now that you’ve learned a bit about how these great little appliances work, I’d like to show you the top four picks I’ve come up with. This will make you an informed and ready consumer. Okay, this electric moka pot is really futuristic and cool looking. It is an efficient and fun way to make espresso the way it was intended using the Moka process. Your espresso is sure to never burn or overflow when it comes to the safety minded auto shutoff. And there is also a keep-warm function that keeps your espresso hot for a half hour. Great for those of us that get easily sidetracked! You can monitor the brewing process with ease with the transparent chamber. It is super durable and a breeze to clean up. You can have the choice of making three or six cups of espresso with the super convenient filter adapter. And the serving process is simple, just use the detachable base to carry it where it needs to go. Great for brunch days with friends or chats when a buddy pops by for a visit. Testing this one out was a lot of fun. I loaded it up with my favorite grind from the market and set it up for the whole banana-that’s right, six cups of amazing espresso. Everything went well, and my beans tasted as good as I remember-I chose a standard brew from store for all my tests as I had had it so many times I knew how it should taste. This went well, and I credit the quality construction of this moka pot for the ease of use and great taste. It is nice and compact and provides convenience and quality in one great package. All I had to do to make my espresso was fill the aluminum boiler up with water, and then fill the filter with my grinds. After that I attached the coffee container to the base and then plug it in, press on, and wait for that sweet, sweet gold to come for my mouth. Even though this is an authentic Italian product, those of you in North America will be happy to know it is 120 volts so you need not buy and adapter to use this great moka pot. You will need to replace the gasket on this and every other moka pot you get every now and again. You can get one of these in an Italian home supply store, on the internet, and even in a hardware store. Gaskets are pretty standard sizes that are measured by the number of cups the moka pot can make. Just check online if you do not live in a place featuring an Italian store. Container is BPA free so it’s safe to use even while plastic. Makes six cups of espresso, need I say more. If you need to you can make just one or two cups at a time. Gaskets may or may not be hard to come by depending on where you live. Plastic container is entirely safe but may be off putting to some. It is electric, whereas the most authentic ones are used on the stove. On first glance I loved how this cute little espresso maker came in a whole variety of different colors. You want red, blue, white or all three? Okay, order them! This lovely stovetop espresso maker is also priced in a way that nearly all of us can afford. It featured exciting and high quality polished aluminum in its construction. The boiler capacity is ten ounces, or 200 mL. You can easily take it apart and clean it and put it back together-and you get to look forward to a 2-year warranty above all else. Yeah, I too was excited about it, and for good reason. Once again, I used my classic market brew to test it out. 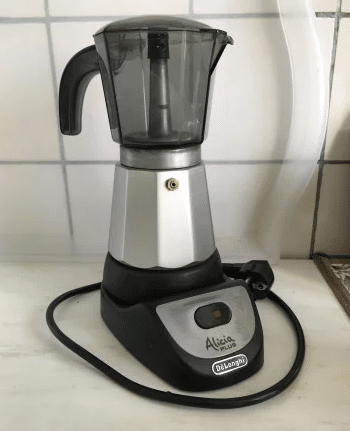 It was really easy to use and while it lacked some features of the other one-the Alicia-it was still a nice maker that really made the experience authentic. I had to fire up my stove in the morning and let this little guy work its magic. Yes, I was happy when it got it. The taste was great, and the crema did not disappoint. Made me look forward to waking up early for work the next day! If you want the real deal, go here. This Bialetti Moka Express boasts more than 80 years of classic design elegance and simplicity in technology. 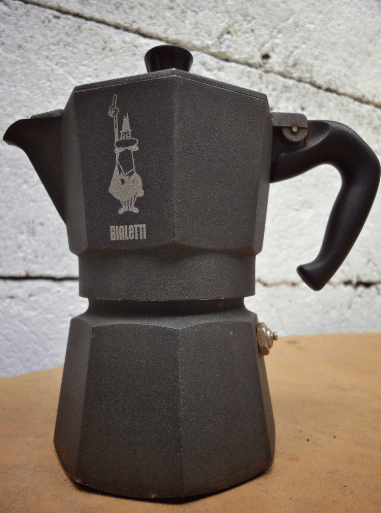 Remember, this is the king of all the moka pots-still being made today! From the early 50s to the present, over 200 million moka pots have been made. This is the iconic way to enjoy coffee as the Italian people meant it to be. 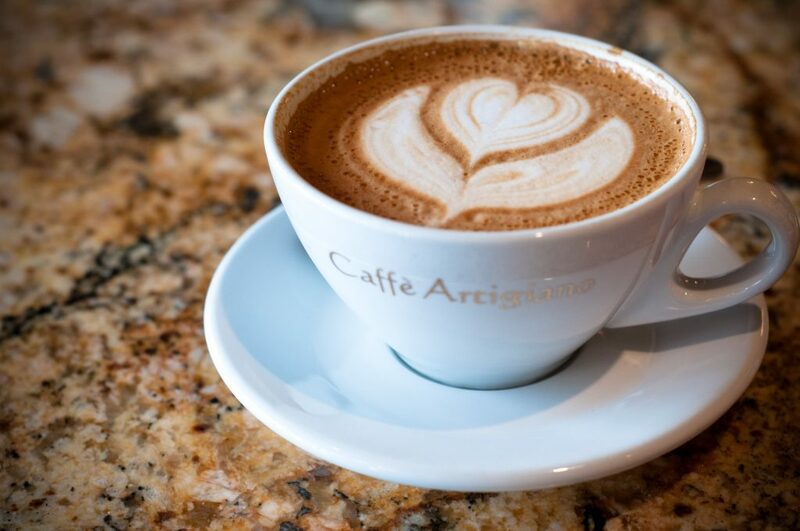 You will love the rich and full espresso you get in mere moments. The eight-sided shape allows it to diffuse the heat perfectly so that the aroma of the coffee is enhanced. The process of making the coffee was a lot like the others, and I will outline it here. You simply add water, filling up the lower chamber with cold water right below the valve. Next up, just add the coffee in there. You can insert the funnel and fill it with ground espresso– do not tamp it, though. 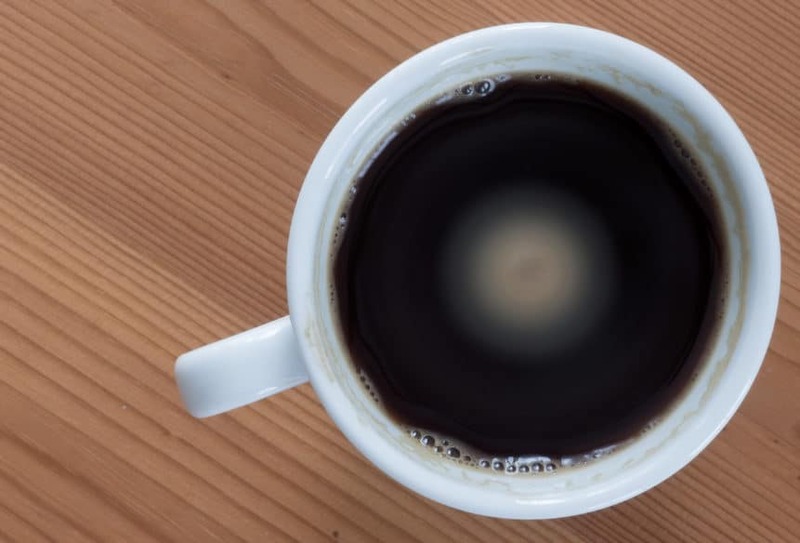 Remove any coffee grounds that may be remaining on the edge of your funnel. Then tightly screw in the upper part of the pot onto the base. And be sure that you avoid using the handle for leverage. Afterward add the heat. I put mine right on my stovetop, as you are supposed to. Make sure you choose the right burner for the bottom of the pot. Your flame should NOT come around the sides of the pot if you are using a gas stove. Heat it up until the water boils and the coffee comes out of the center post. Bear in mind you might hear a gurgling sound during this process. When the top of the pot is full, just remove it from the stove. Before you pour the coffee, stir it in the upper chamber with a little spoon so that you equalize the different coffee layers for the most epic flavor you can imagine. Bialetti also left a few good tips behind for great moka use, so I will share them now. Be sure to grind coffee for moka use and make it slightly coarser than espresso. 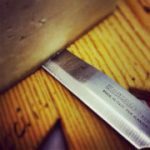 Did you know that smooth versus coarse grind really makes a difference? Look it up if you don’t believe me! This coffee business is no joke…and don’t get me started on conical vs. burr grinders. Just do your best to make it coarse. If the coffee comes out tasting burnt-it happens to the best of us-try lowering down the heat on your next batch. You might have to do some trial and error as you work your way through this process. And if you can always use filtered water. 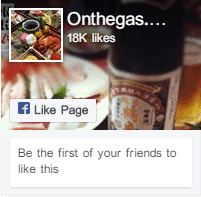 This is going to give you the very best in taste. All in all, I was really happy to test this one out. It was absolutely my favorite out of the entire pick, so please forgive me if I sound a bit biased. Reasons I really liked it was the nice price tag and the authentic experience-also I really enjoyed the taste that came out of this little appliance. It tastes just like the stuff I could get at my local coffee shops, just minus the huge price tag. I mean did you know that this thing is found in nine out of ten Italian homes? I’m not kidding, either! They don’t just buy it for show-it’s there because it works. One thing I would like to clarify is that the appliance is in fact called an Espresso maker, but remember, you are getting moka from this machine. The pressure applied is not enough for it to actually be espresso. Now this should not sway you from taking part in this amazing little product, but just keep that in mind if you’re buying for a huge coffee nerd like yourself or a friend. I personally love what I get, and I think you will too. This thing more or less will pay for itself over time because you aren’t going to be throwing away five dollars every few days buying yourself one of those fancy mocha/ espresso beverages. The taste out of this thing is utter excellence. The different colors you can get are stunning and look good in all kitchens. The experience is authentic and just how moka should be made. This is time consuming for new moka lovers, but you will get it. It can be hard to get the coffee to brew just right. Cleaning it is hard the first few times, but you will learn how to do it over time. My first impression when I took a look at this pot was…wow. It looks super fancy, and I was afraid to put my fingers on the moka pot because I just knew I was going to put fingerprints all over it. Indeed, it is a beautiful thing and would look great in your kitchen, especially if you have a very upscale or luxury setup. This review examines the ten-cup model. However, you can enjoy this lovely moka pot in 4, 6 or 10 cup sizes depending on your lifestyle needs. If you want to make less coffee just fill the base halfway to the safety valve with filtered water. Then place the funnel filter into the base. After that place the reducer in to the funnel filter and this will reduce capacity for espresso coffee grounds by one half. Then add the espresso ground coffee on top of the reducer. I had a great time testing this out, definitely felt like I was living lavishly making my drink! I followed all the standard steps. Upon reaching the part where I wait for the espresso to rise, I pored over the instructions for a bit. I realized Cuisinox advises that if you have a gas stovetop the flames should not come around the sides of the pot. My apartment has an electric range, so I needn’t worry-but do keep that in mind if you own and operate a gas stove. The moka tasted nice and smooth. All I can say is, even though this one looks the fanciest, it does not perform any better than the lower priced brands. So, buy this if you love how it looks-but keep in mind the other brands do a great job. Extra gaskets and reducers come with these coffee pots, which is a nice value add. It definitely keeps true to the real Italian way of making espresso. The stainless steel is tough and easy to clean. Any coffee lover would be delighted to have this great pot in their home. Looks stunning and is also functional. Comes with an extra gasket and reducer. Pot is nice and heavy and can go in dishwasher if needed, but cleaning by hand is ideal. Handle conducts heat as it is metal and not plastic. Cleaning is a bit tough around the ridge in the coffee reservoir-butter knife needed to clean it out thoroughly. Some may be displeased with the pot not actually being made in Italy. Here we have a neat little Italian moka pot that can hold up to 12 cups of espresso…now these guys are talking my language! It looks absolutely super sitting there on your range top, when I unpacked the box for testing, I was delighted to see how nice it looked. It comes in a few different colors, but I was happy to get the standard aluminum model. Now the looks are just part of the appeal of this lovely espresso maker…wait until we show you the features. You can count on this particular moka pot being easier to use than some of the electric moka pots you might have heard of or seen. 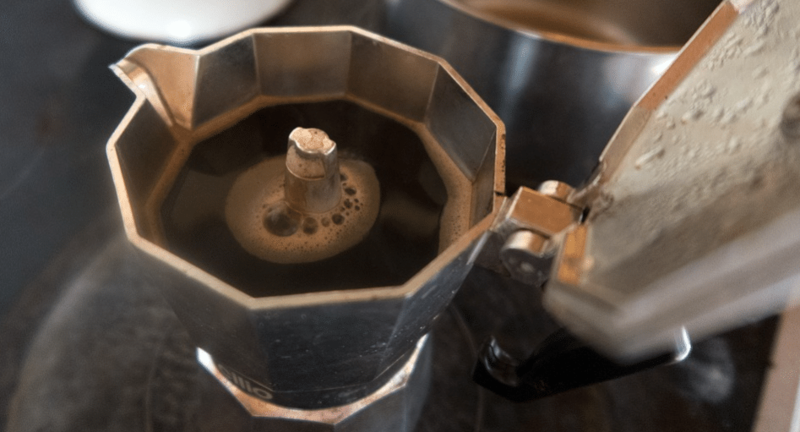 This is the authentic Italian way of making moka, using your stovetop. It takes only minutes and you can enjoy the amazing bold taste of espresso and moka right there at home. Can you imagine getting up and looking forward to this delicious treat each and every day? The Primula design is eight sided and features the design all great moka lovers have come to expect when it comes to a pot like this-that is, one that allows heat to diffuse perfectly, and simultaneously optimizes flavors of espresso or even Cuban coffee. That’s right-we are getting cross-cultural with this pot! 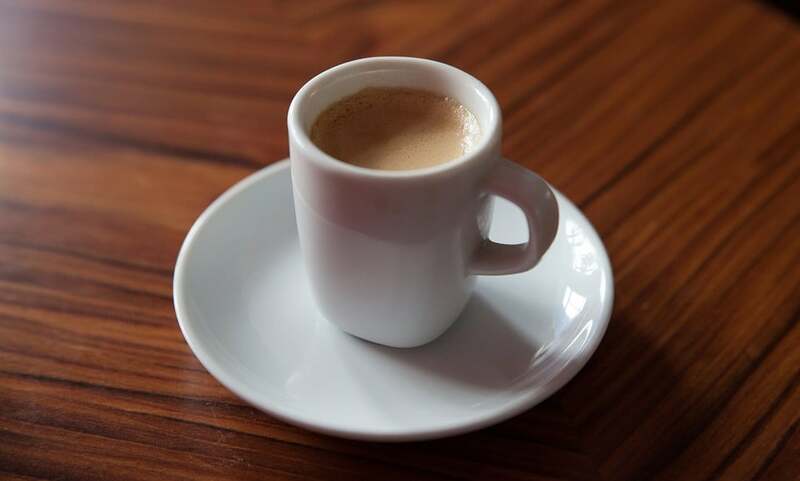 You are going to love serving everybody their own espresso in demitasse cups, and nobody has to go without when you can make 12 wonderful cups for people to enjoy alone or with a slice of delicious pie or cake. The way to make the best brew you ever had is so easy with this great moka pot. The steps here are pretty easy-start by adding the water to the base of the espresso maker, add the coffee, put it over medium heat, and then enjoy! Of course, it is a little more complicated than that, but it’s only four small steps to a world of amazing flavor. I surely enjoyed my cups, and it just so happened that my mom and sister were over while I was testing it. They too enjoyed the rich taste that this Italian moka pot brought to them. I think what I liked most about this is that it eliminates the hassle that sometimes comes with electric pots. I also found that it performed just as well as the Bialetti model, but at less of a price and more moka made at the end of the day. Of course, you can get a Bialetti 12 cup model, but this one really offers great quality that is like that of the Bialetti. This pot just works oh so perfectly. The key is using the correct amount of heat, filling the water up just a wee bit under the valve, and screwing the two halves of the pot together very tightly. I highly recommend some silicone grippers if you have trouble doing this. All in all, this is a really stellar moka pot that gives you a TON of great espresso to drink, the authentic Italian coffee experience, and lends your kitchen really great aesthetic. This pot is beautiful to look at! The biggest of all the moka pots we have tested. Great for Cuban and Puerto Rican style coffee, too. Must season the moka pot first with a few brews to get the aluminum taste out. Some users reported handles breaking off during use. Users reported leaking at the seams while pouring their drink. Moka, moka everywhere! Finding the best moka pot is not so hard once you have an idea of what you want. If you love to have friends over, go with the last option and get the Primula 12-cup pot. If you just need to have that little bit of luxury in your life when you sip, go for the Cuisinox. And if you just want the convenience factor, go for the Delonghi, which is the best moka pot in the market. For the true, authentic way of Italian coffee, go for the Bialetti. No matter which of these great pots you end up with, you will get a great value for money and plenty of great drinks ahead of you for years to come. Go get some tiny cups and your favorite beans and get to work!